People with diabetes could soon have a pain-free way to check their blood glucose levels. Researchers at the University of Missouri–St. Louis have developed a portable, inexpensive non-invasive blood glucose detector; the university has licensed patent rights for the device to St. Louis Medical Devices, Inc., a Missouri company headquartered at UMSL’s own startup company incubator – IT Enterprises, to bring the device to market. For more info, click here. On November 23, St. Louis Beacon released a lengthy, compelling story by Robert Joiner about the importance of diabetes education and the role the St. Louis Diabetes Coalition is playing in assisting people with diabetes. Be sure to read it. Click here: Public health workers place their bets on diabetes education. The article features the perspective of two participants (Milton and Leona Scott) from the April SoWhatCanIEat? event and comments by the Coalition’s Director of Education Joan McGinnis, RN, MSN, CDE and Saint Louis University professors Dr. Thomas Burroughs and Dr. Eric Armbrecht. The Coalition thanks the St. Louis Beacon for its recent analysis and coverage of diabetes care from a public health point of view. 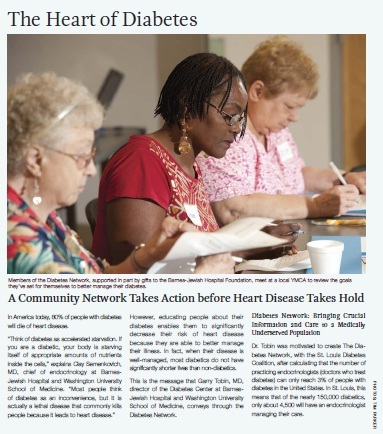 The Diabetes Network of St. Louis, a community collaborative founded by the St. Louis Diabetes Coalition, was featured in the philanthropic magazine Giving (September 2010), a publication of Barnes-Jewish Hospital Foundation. The program’s co-principal investigator Dr. Garry Tobin is quoted in the article citing the primary purpose of the program: “The Diabetes Network is really about building relationships in the community.” Click here to view the article. 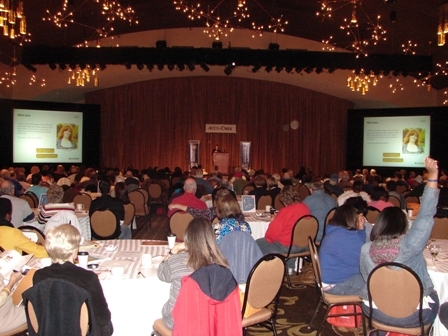 For more information about the Diabetes Network of St. Louis, please contact Dr. Garry Tobin or Dr. Eric Armbrecht.